What is complementary or alternative treatment or CAM? What is of multiple sclerosis (MS)? What alternative treatments can be used for MS symptoms? What about medical marijuana (cannabis) for MS symptoms? Who is eligible to pursue treatment with CAM? How much does CAM cost? What are the potential risks and side effects of CAM? What different types of CAM were studied in the National Health Interview Survey? Fatigue and muscle spasticity are the symptoms of MS that are best addressed by complementary or alternative treatment or medicine (CAM). Massage therapy and acupuncture have been reported by some to provide relief for spasticity. Ongoing studies are being conducted to look at the potential benefits of medical marijuana on MS symptoms; to include chronic pain and spasticity. Marinol and Sativex, two FDA approved forms of medical marijuana (medical cannabis) may be beneficial in improving spasticity or bladder frequency. People who desire CAM therapies generally feel that conventional treatments are not effective in controlling their symptoms or that the side effects are not acceptable. Most CAM therapies are not covered by insurance. It is important to discuss the use of CAM therapies with your health-care professional, since some CAM therapies may interact adversely with medications. CAM has not been shown to have significant effects on the progression of MS over time. Some people who seek out alternative medicine feel that conventional therapy has not successfully controlled their symptoms, or that the potential side effects associated with traditional therapy aren't acceptable. Others find that adding complementary medicine to their program allows improved control of symptoms. When complementary medicine is added to traditional routes, it is referred to as integrative medicine. Recent studies through the US Centers for Disease Control and Prevention (CDC), specifically the National Health Interview Survey, suggest that as many as 38% of residents within the United States seek out CAM. Many therapies that are considered within the group of complementary and alternative medicines haven't been studied extensively or investigated in comparison to conventional treatment options. Multiple sclerosis (MS) is a disease that causes demyelination of the brain and spinal cord, or a loss of the covering around axons. When this occurs, the axons (the parts of the nerve cells that transmit impulses to other cells) don't work well. As more areas of the central nervous system are affected by the loss of myelin, different symptoms develop. Visual disturbances (for example, blurred vision or loss of vision in one eye) that may be accompanied by eye pain. as MS progresses, some patients are left with muscle spasticity, which is an involuntary painful contraction of some muscles. Fatigue and spasticity seem to respond best to CAM. Spasticity has reportedly been reduced with the use of acupuncture and massage therapy. A sense of tingling (paresthesias) have been reportedly improved with reflexology. Symptoms including depression, memory loss, urinary incontinence, and progression of MS itself (including relapses, disease extent as measured on MRI), and disability have had limited improvement when treated with CAM. None of these treatments led to any significant benefit in the studied symptoms. Anyone can participate CAM therapy. However, it is important to recognize that most of these therapies are not covered by insurance, and may be an "out of pocket" cost for patients with MS. Patients who decide to pursue CAM need to share this information with their physicians, as some supplements may interact with convention medication and lead to side effects. The costs of CAM can vary widely; regular exercise and yoga can be low or no-cost options, while massage therapy, acupuncture, and some supplements can be quite expensive. Every patient must have a good relationship with treating health-care professionals of traditional and non-traditional therapies to best understand potential costs. Side effects of CAM vary depending on the treatment. gastric disturbances, such as nausea or constipation. Some supplements can increase the risk of bleeding (gingko biloba) or interact with traditional medications. Infections may occur when the skin is punctured, such as with acupuncture. Some patients expect CAM to be able to out-perform conventional treatments, despite a lack of scientific evidence. If this doesn't occur, patients may feel discouraged. It is important to discuss any potential or ongoing use of CAM with your health-care professional, who may need to adjust your current therapies to prevent any adverse effects caused by interactions between the two types of therapies. Clarke TC, Black LI, Stussman BJ, Barnes PM, Nahin, RL. Trends in the Use of Complementary Health Approaches Among Adults: United States, 2002-2012. National Health Statistics Reports. Number 79; February 10, 2015. The National Multiple Sclerosis Society. MS Symptoms. UpToDate. Patient information: Multiple sclerosis in adults (The Basics). Yadav V, Bourdette D. Complementary and Alternative Medicine: Is There a Role in Multiple Sclerosis? Current Neurology and Neuroscience Reports 2006, 6:259–267. Yadav V, Bever C, Bowen J, et al. Summary of evidence-basaed guideline: Complementary and alternative medicine in multiple sclerosis. Report of the Guideline Development Subcommittee of the American Academy of Neurology. Neurology 2014;82;1083-1092. What causes multiple sclerosis? Take the multiple sclerosis (MS) quiz and learn about the signs, symptoms, treatment, diagnosis, life expectancy, and prognosis. Please share your experience with alternative treatments and/or integrated medicine and multiple sclerosis (MS). What alternative treatments have been helpful with your MS symptoms? Please share your experience with using medical marijuana to treat MS symptoms. What MS symptoms are have you experienced? 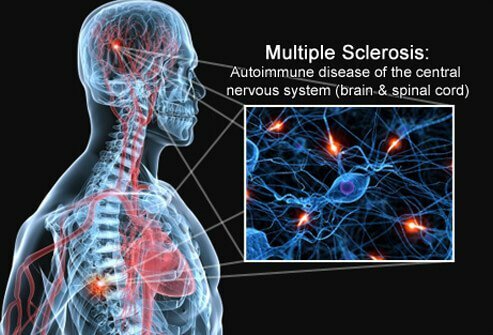 ALS (amyotrophic lateral sclerosis, Lou Gehrig's disease) and MS (multiple sclerosis) are both diseases of the nervous system (neurodegenerative). ALS is a disease in which the nerve cells in the body are attacked by the immune system, although it's not considered an autoimmune disease by some scientists. MS is an autoimmune disease in which the insulated covering of the nerves (myelin sheath) in the CNS (central nervous system) degenerate, or deteriorate. Scientists don't know the exact cause of either problem. However, they have discovered that mutations in the gene that produces the SOD1 enzyme were associated with some cases of familial ALS. Scientists also theorize that multiple sclerosis may be caused by infection or vitamin D deficiency. ALS occurs between 50-70 years of age (the average age of occurrence ALS is 55), and mostly affects men. While MS occurs between 20-60 years of age, and mostly affects women. About 30,000 people in the US have ALS, and an average of 5,000 new diagnoses per year (that's about 15 new cases per week). Worldwide, MS affects more than 2.3 million people, with about 10,000 new cases diagnosed each year (that's about 200 new diagnoses per week). Some of the signs and symptoms of both diseases include muscle weakness, muscle spasms, problems walking, fatigue, slurred speech, and problems swallowing. ALS signs and symptoms that are different from MS include problems holding the head upright, clumsiness, muscle cramps and twitches, problems holding objects, and uncontrollable periods of laughing or crying. MS signs and symptoms that are different from ALS include vision problems, vertigo and balance problems, sexual problems, memory problems, depression, mood swings, and digestive problems. There is no cure for either disease, however the prognosis and life expectancy are different. Multiple sclerosis is not a fatal condition, while ALS progresses rapidly and leads to death. What is medical marijuana (MMJ)? Learn about THC, CBD, and other cannabinoids, learn about marijuana scheduling, state laws for medical marijuana, marijuana addiction, the use of medical marijuana in treatment of seizures in children, edibles, topicals, smoke, and vape, and more. Multiple Sclerosis is a debilitating neurological condition. Take the MS Quiz to test your knowledge of the causes, symptoms, risks and treatments. In multiple sclerosis, an agent such as a virus or foreign antigen, in theory, may alter or interact with the immune system so that the immune system perceives myelin as an intruder and attacks it. See a picture of Nerve Fibers and Myelin Attack in MS and learn more about the health topic. What happens to the body when there is a vitamin D deficiency? Take the Vitamin D Quiz to find out what you may be missing.